I hadn’t fully appreciated just how much colder Scotland is than London before we moved back, despite having lived here for most of my life. It doesn’t help that the flat we’re renting (while absolutely beautiful) has really high ceilings and single glazing throughout. It does also have a great heating system but sometimes even that is just not enough. However, woolly socks to the rescue! It’s amazing how much warmer everything feels with a pair of woolly socks on, which means that there’s only one solution – I need to knit Steven and me a lot more socks. 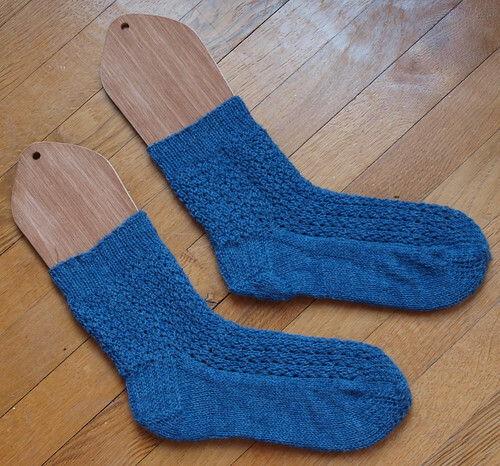 The pattern is a free pattern: Winter Lace Socks and the yarn is Cygnet Truly Wool Rich 4 ply. The lace pattern is very simple to follow and makes a very nice sock. I had hoped to get a pair out of a single ball of yarn but ended up having to start a second for the toe of the second sock. And now they’re keeping my feet toasty warm while I blog – expect to see more socks soon! This entry was posted on Saturday, November 10th, 2012 at 10:38 am	and is filed under knitting. You can follow any responses to this entry through the RSS 2.0 feed. You can leave a response, or trackback from your own site.